Thanks so much for those who signed and supported our action. 69 Canadian citizens and residents signed on to this statement, and 75 non-Canadians from Japan, US, and Europe expressed their support as well. We closed our action on March 26 and finalized our document, including the list of signers. On March 26 and 27 (by the North American time), we will submit this statement, with signatures, to Mr. Abe and Mr. Hayashi electronically and by mail. See HERE for the statements with the list of signers. l Below are English, French, Japanese versions of the statement, followed by the list of 37 signers as of March 8. We will add to this list as signatures come in. Jackie Johnson, Professor, University of British Columbia, Vancouver, BC. Yoko Tanaka　田中洋子, a retired teacher, Toronto, ON. l Please allow the organizer to make minor modifications to how your signature appears, if necessary. If it’s too long, we may shorten it. We also list all names without “Dr.” “Ms.”, etc. Thanks for your understanding. l Deadline for accepting signatures is: March 22 (subject to a minor change without notice). l Signatures that arrive after the deadline will be added on this page too. l We will not be able to accept any changes to the wording of the statement at this point. Thank you for your understanding! The Law Concerning Tuition Waiver and Tuition Support for High School Education (henceforth referred to as the “High School Tuition Waiver Law”), enacted in 2010, provides tuition support not only to private high school studentsi but also to students of “Foreign Schools (Gaikokujin Gakko)”ii licensed as “miscellaneous schools.” This is because the first article of the law stipulates that it “aims to reduce the financial burden related to high school education; thereby helping to create equal opportunities in education. However, despite their being categorized as “Foreign Schools (Gaikokujin Gakko),” to date, only Korean Schools (Chosen Gakko) have been excluded from this program. Indicating the illegality of this disposition, graduates of Korean Schools and educational institutions that run Korean Schools have filed lawsuits against the government, in five different locations in Japan. So far, the Osaka District Court has ruled in favour of the plaintiff, and ordered the government to retract the disposition. On the other hand, the Hiroshima District Court and the Tokyo District Court have deemed the disposition to be legal, saying that it sits within the bounds of the discretionary powers granted to MEXT. We, citizens and residents of Canada who have connections to Japan (in various forms such as being Canadians with Japanese ancestry and scholars of Japan) have been very much concerned with this situation. We decided to issue this statement, believing that we could express opinions based on our Canadian experience. Canada has accepted immigrants and refugees from around the world, recognizing its multi-ethnic, multi-cultural, and multi-lingual diversity as the country’s strength. Looking at history, Canada was not always this way. For example, during WWII, Canada incarcerated Japanese Canadians as “enemy aliens” and placed them in internment camps until after the war was over. For over a century from the 1870s, Canada removed indigenous children from their families and sent them to Indian Residential Schools, where they were deprived of their own culture, and were forced to learn Christian Canada’s culture and languages. Now, massive amounts of material and testimonies that have been preserved and made available in public archives and libraries allow Canadians to learn details of how their country’s systematic discrimination against specific races and ethnic groups caused great damage to the dignity of the victims and brought long-lasting, irreparable suffering to their families and communities. These materials also tell us how the presence of such discrimination brings about significant moral degradation in society as a whole. While it is still not enough, Canadian schools do teach these dark histories. The Canadian government, though belatedly, apologized to Japanese Canadians in 1988, and to the victims of the Indian Residential Schools in 2008, with then prime ministers delivering apologies in front of the respective representatives of the victimized communities. The Canadian government also provided compensation, however symbolic it may have been, to the affected individuals and communities. For the indigenous peoples, the deep scars from the long period of injustice are yet to be healed and inequality in society remains. The way Canadians look at the issues surrounding indigenous people, however, is certainly changing. Now, we have indigenous members of the Cabinet, members of the House of Commons and members of the provincial legislative assemblies. Opportunities for Canadians to learn about indigenous peoples are increasing. For Japanese Canadians, the impact of the internment still remains for many of the first and second generations, but it is now harder to detect the scars of this dark history in the younger generations. We believe that every human society contains issues of discrimination that need to be overcome, but we have seen evidence of the betterment of society as a whole when the government has acknowledged past mistakes and atoned for them. In addition, what we find strange in the series of news reports on the issue of the exclusion of Korean Schools from the Tuition Waiver Program, is that they have said very little about the historical background of Koreans in Japan (Zainichi Koreans) and the history of the Korean Schools in Japan. The Osaka District Court did very well on this manner too, referring to the historical background and stressing the need for language education and ethnic education in the Korean Schools, but the rulings at the Hiroshima District Court and Tokyo District Court make no reference to such history. Japan colonized the Korean Peninsula with the imposition of the Japan-Korea Annexation Treaty of 1910. Japan deprived Koreans of their land and of their language, under the assimilation policy, and even of names, under the Soshi-kaimei policy. During the colonial period, many Korean people had no choice but to come to Japan because they had lost their means of livelihood at home due to the colonial rule, which continued until Japan’s defeat in WWII in 1945. From 1939, Japan started forced mobilization of Koreans in order to deal with the labour shortage caused by the country’s full-scale war of aggression in Asia. Until Japan’s defeat, more than one million Koreans were forcefully mobilized to work. Many people lost their lives during that period due to the cruel working and living conditions. By the end of the war, there were more than 2.3 million Koreans living in Japan. Massive repatriation happened after liberation, but approximately 500,000 Koreans remained in Japan. Today’s Zainichi Koreans are mostly their descendants. These Korean people set up schools, starting with small neighbourhood schools, in order to teach their children their language, their ethnic pride, and their history, which they had been largely deprived of during the colonial period. Considering such history, Korean Schools should have been given the top priority when the government decided to apply the tuition support program to foreign schools. Moreover, the Japanese government should make historical documents available to the public in places accessible to all. It is hard to imagine that people in Japan would be as unwise as to still support the exclusion of Korean Schools from the Tuition Waiver Program, once they come to know the history of Koreans in Japan. United Nations organizations such as the Committee on Economic, Social and Cultural Rights and the Committee on the Elimination of Racial Discrimination have repeatedly issued corrective recommendations and expressed concern over the Japanese government’s exclusion of Korean Schools from its High School Tuition Waiver and Tuition Support program, and the subsequent decisions by the nation’s many local governments to discontinue their own subsidy programs to the Korean Schools in their jurisdiction. This reflects what the world would see as common sense. But in Japan, the government specifically targets students of Korean Schools and refuses to provide tuition support. Local governments also discontinue educational subsidies for Korean Schools only. Some media outlets openly run negative campaigns, full of lies, against Korean Schools. 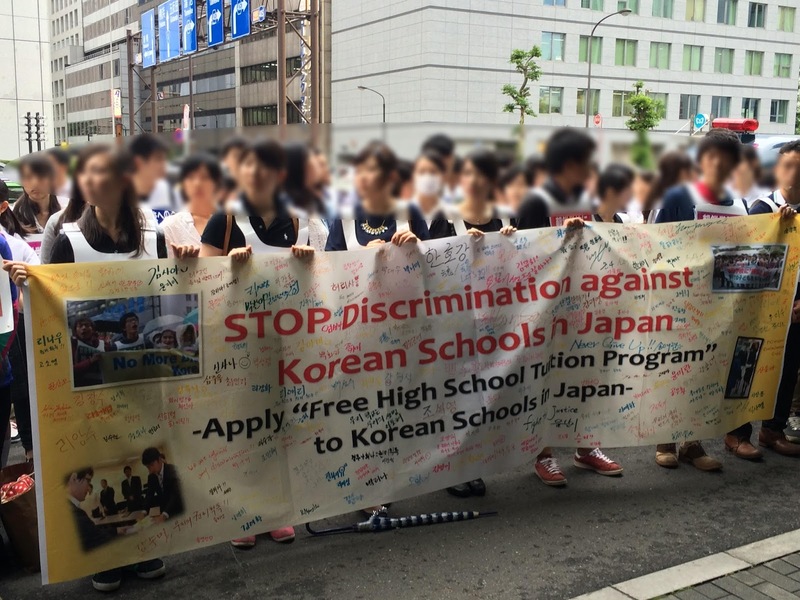 There have been ongoing hate demonstrations against Koreans and Korean Schools out on the streets across Japan. There have even been physical attacks on Korean Schools attended by elementary school students. If we look at this in terms of the universal standard of human rights, these are nothing less than acts of racial discrimination by the public authorities, which have led to the moral distortion of society as a whole. The people of Japan should not stand by and watch this as though it were someone else’s problem. This issue challenges Japanese people to consider the very nature of their society. Many of the Korean School students are fourth-generation Zainichi Koreans. They may have either Korean registration status, Republic of Korea citizenship, or Japanese citizenship. But no matter what their status is, these children are indisputably children of Japanese society. It is the duty of the Japanese government to provide an environment in which these children can have a sense of security and receive the kind of education they wish to. It is also the responsibility of all adults living in Japan to create a society that embraces universally accepted standards of human rights as its norm. It is a matter of concern for all children in Japan, not just Korean School children, that they can learn in a just society that lives up to such standards. We strongly call for the immediate application of the High School Tuition Waiver Program to Korean High Schools. We stand in solidarity with all people in Japan who are fighting for this cause. i. Equivalent of Grade 10, 11, 12.
ii. “Foreign Schools (gaikokujin gakko)” refers to international schools and schools that provide ethnic education in Japan. La Loi relative à la Dérogation de Scolarité et le Soutien de Scolarité pour les Écoles secondaires (ci-après appelée « La Loi sur la Dérogation de Scolarité des Écoles secondaires »), adoptée en 2010, offre un soutien à la scolarité non seulement aux étudiants d’écoles privées, mais aussi aux étudiants d’écoles étrangères (Gaikokujin Gakko)i immatriculées comme étant des « écoles diverses ». Ceci étant parce que l’article premier de la loi stipule « viser à réduire les charges financières reliées à l’éducation secondaire; contribuant ainsi à créer des opportunités égales en éducation. » Cependant, seul les Écoles coréennes (Chosen Gakko) ont été, jusqu’à maintenant, exclues de ce programme, malgré leur statut « d’École Étrangère ». Citant l’illégalité de cette mesure, les finissants des Écoles coréennes et les institutions éducatives qui dirigent les Écoles coréennes intentent une poursuite contre le gouvernement dans cinq lieux différents au Japon. Jusqu’ici, La Cour Régionale d’Osaka a trouvé en faveur du demandeur et a ordonné au gouvernement de retirer cette mesure. Par contre, la Cour Régionale d’Hiroshima et la Cour Régionale de Tokyo ont trouvé que la mesure est légitime, citant qu’elle se trouve dans les limites du pouvoir discrétionnaire accordé au MEXT. Nous, citoyens et résidents du Canada ayant des liens avec le Japon (sous différentes formes, notamment en étant des Canadiens de descendance japonaise et érudits du Japon), nous sommes très préoccupés par cette situation. Nous avons décidé de publier cette déclaration, pensant que nous pourrions exprimer des opinions basées sur nos expériences canadiennes. Le Canada a accueilli des immigrants et des réfugiés de partout dans le monde, reconnaissant que la diversité ethnique, culturelle et linguistique font la force du pays. En jetant un regard sur l’histoire, le Canada n’a pas toujours été de la sorte. Par exemple, pendant la Deuxième Guerre mondiale, le Canada a emprisonné les Canadiens d’origine japonaise en les qualifiant d’« ennemis étrangers » et les a mis dans des camps d’internement jusqu’après la fin de la guerre. Pendant plus d’un siècle depuis les années 1870, le Canada a enlevé les enfants des Premières Nations pour les placer dans des Écoles Résidentielles Autochtones. Ces enfants ont été privés de leur culture et ont été forcés d’apprendre la culture et la langue du Canada chrétien. À présent, un grand nombre de documents et de témoignages préservés et disponibles au public dans les archives et bibliothèques permettent aux Canadiens d’apprendre en détail comment la discrimination systématique de leur pays contre des races spécifiques et groupes ethniques a causé des dommages à la dignité de leurs victimes et ont provoqué de graves et irréparables souffrances à leurs familles et communautés. Ces documents démontrent aussi comment la présence d’une telle discrimination peut engendrer une dégradation morale significative au sein de la société en général. Il y a encore beaucoup à faire, mais ce passé sombre est maintenant enseigné dans les écoles canadiennes. Par le biais du Premier ministre de l’époque, le gouvernement canadien a, bien que tardivement, présenté ses excuses aux représentants des Canadiens japonais en 1988, et aux victimes des Écoles Résidentielles Autochtones en 2008. Une compensation, quoique symbolique, était stipulée pour les individus et les communautés affectés. Pour le peuple autochtone, les cicatrices profondes subies après une longue période d’injustice prendront encore du temps à guérir, et il reste encore beaucoup d’inégalités. Il est certain que les Canadiens voient d’un œil différent les questions concernant les Premières Nations. Nous avons maintenant des représentants autochtones au sein du gouvernement, membres de la Chambre des communes, et membres d’assemblées législatives provinciales. Les occasions d’apprendre sur les peuples indigènes ne cessent de croître. Pour les Canadiens japonais, l’impact de l’internement se fait encore ressentir auprès des premières et deuxièmes générations, mais il est plus difficile de détecter les séquelles de cette histoire noire au sein des générations plus jeunes. Nous pensons que toutes les sociétés humaines comportent des contextes de discrimination qu’elles doivent surmonter, mais nous pouvons témoigner de l’amélioration de la société quand le gouvernement reconnaît ses erreurs et les répare. De plus, nous trouvons étrange que les reportages médiatiques concernant l’exclusion des Écoles coréennes du Programme de Dérogation de Scolarité font peu de références au contexte historique des Coréens vivant au Japon (Coréens Zainichi) et l’histoire des Écoles coréennes au Japon. La Cour Régionale d’Osaka s’est démontrée bien informée, faisant référence au contexte historique des Écoles coréennes et en mettant l’accent sur le besoin d’éducation ethnique et linguistique; pourtant les décisions de la Cour Régionale d’Hiroshima et de la Cour Régionale de Tokyo ne font aucune référence à l’histoire. En imposant le Traité d’Annexion de la Corée par le Japon en 1910, le Japon colonisait la péninsule Coréenne. Sous le programme d’assimilation, le Japon a privé les Coréens de leurs terres et de leur langue; sous la politique Soshi-kaimei, même leurs noms étaient interdits. Sous la colonisation, qui perdurera jusqu’à la défaite du Japon à la fin de la Deuxième Guerre mondiale, plusieurs Coréens n’avaient d’autre choix que de s’installer au Japon puisqu’ils n’avaient plus les moyens de gagner leur vie. À partir de 1939, le Japon met en place la mobilisation forcée des Coréens pour subvenir au manque de main-d’œuvre causé par l’agression à grande échelle en Asie. Jusqu’à la défaite du Japon, plus d’un million de Coréens avaient été mobilisés de force. Plusieurs ont perdu leur vie durant cette période à cause des conditions de vie et de travail cruelles. Vers la fin de la guerre, plus de 2,3 millions de Coréens vivaient au Japon. Un rapatriement massif a eu lieu après la libération de la Corée, mais environ 500 000 Coréens sont restés au Japon. Les Coréens Zainichi présentement au Japon sont en majorité leurs descendants. Ces Coréens ont fondé des écoles, en commençant avec de petites écoles de quartier, afin d’enseigner à leurs enfants leur langue, leur fierté culturelle et leur histoire, ce qui leur avait été privé durant la colonisation. En tenant compte de ce fait historique, les Écoles coréennes auraient dû être considérées par le gouvernement japonais comme candidates prioritaires aux aides à la scolarité. De plus, le gouvernement japonais devrait rendre les documents historiques publics et accessibles à tous. Il est difficile d’imaginer que le peuple japonais serait si imprudent à continuer de soutenir l’exclusion du Programme de Dérogation à la Scolarité des Écoles coréennes s’il connaissait l’histoire des Coréens au Japon. Des organisations onusiennes, tels que le Comité des droits économiques, sociaux et culturels et le Comité pour l’élimination de la discrimination raciale ont maintes fois publié des recommandations correctives et ont exprimé des craintes à l’égard de l’exclusion par le gouvernement japonais des Écoles coréennes au Programme de Dérogation à la Scolarité, suite à laquelle plusieurs gouvernements locaux ont décidé de discontinuer les subventions envers les Écoles coréennes sous leur compétence territoriale. Ces craintes reflètent ce que tout autre personne considèrerait comme étant le sens commun. Par contre, au Japon, le gouvernement vise spécifiquement les étudiants des Écoles coréennes et refuse le soutien à la scolarité. Les gouvernements locaux ont aussi mis fin aux subventions éducatives uniquement pour les Écoles coréennes. Certains médias lancent ouvertement des campagnes négatives et mensongères contre les Écoles coréennes. Il y a des manifestations en continu contre les Coréens et les Écoles coréennes dans les rues du Japon. Il y a même eu des cas de vandalisme d’écoles primaires coréennes. En matière de standards universels des droits humains, ces actes sont ni plus ni moins des actes de discrimination raciale perpétrés par les autorités publiques, qui ont engendré une distorsion morale de la société. Le peuple japonais ne devrait pas se croiser les bras et accepter de tels actes comme si c’était le problème d’autrui. Cette question pose le défi aux Japonais de remettre en question la nature même de leur société. Grand nombre des étudiants des Écoles coréennes sont des Coréens Zainichi de quatrième génération. Ils peuvent avoir le statut d’enregistrement coréen, la citoyenneté de la République de Corée ou la citoyenneté japonaise. Mais peu importe leur statut, ces enfants sont sans contredit les enfants de la société japonaise. C’est le devoir du gouvernement du Japon de fournir un environnement dans lequel ces jeunes peuvent se sentir en sécurité et recevoir l’éducation qu’ils désirent. Et c’est aussi le devoir de tout adulte habitant au Japon de créer une société qui engendre les standards universels des droits humains. C’est une question de principe pour tous les enfants du Japon et non seulement pour ceux qui fréquentent les Écoles coréennes, afin qu’ils puissent apprendre au sein d’une société juste et à la hauteur de ces standards. Nous appelons fermement à l’application immédiate du Programme de Dérogation à la Scolarité pour les Écoles coréennes. Nous sommes solidaires avec toutes les personnes au Japon qui se battent pour cette cause. i. « Écoles Étrangères » (gaikokujin gakko) fait référence aux écoles internationales et autres écoles ayant un programme éducatif ethnique au Japon. ii. Article en anglais sur la décision de la Cour Régionale d’Osaka en faveur des écoles coréennes publié dans The Japan Times, le 28 juillet 2017. 1. Sumi Hasegawa　長谷川澄, Article 9 Canada, Retired Faculty Lecturer of McGill University, Montreal, QC. 2. Satoko Oka Norimatsu　乗松聡子, Vancouver, BC. Article 9 Canada, Editor, Asia-Pacific Journal: Japan Focus. 3. Daiyo Sawada, Professor Emeritus of University of Alberta, Edmonton, AB. 4. Grace Eiko Thomson, Vancouver, BC. Japanese Canadian Internment Survivor, Former President, National Association of Japanese Canadians, First Director/Curator, Japanese Canadian National Museum (now Nikkei Museum). 5. Matthew Penney, Associate Professor of History, Concordia University, Montreal, QC. 6. Eiichiro Ochiai　落合栄一郎、Vancouver, Canada. Article 9 Canada, Professor emeritus, Juniata College (PA, USA). 7. Doug Strable ストレーブル・ダグラス, Educational researcher, Vancouver, BC / Tokyo, Japan. 8. Kagari Ando 安藤かがり, Article 9 Canada, Patent Translator, Vancouver Island, BC. 9. Ryuko Kubota　久保田竜子, Article 9 Canada, Researcher, Vancouver, BC. 10. Hiroko Suzuki 鈴木博子, Article 9 Canada, Daycare teacher, Montreal, QC. 11. Dennis Riches, Professor, Seijo University, Tokyo. 12. Ryoko Hashizume 橋爪亮子, Article 9 Canada, Montreal, QC. 13. Tomoe Otsuki大槻とも恵, Article 9 Canada, Researcher, Montreal, QC. 14. Tatsuo Kage鹿毛達雄, Article 9 Canada, Member, Human Rights Committee, Greater Vancouver Japanese Canadian Citizens Association, Vancouver, BC. 15. Tsuyoshi Hashimoto 橋本 剛, Hairstylist, Article 9 Canada, Montreal, QC. 16. Kazumi Marthiensen, Artist, Lethbridge, AB. 17. Ellen Woodsworth, International speaker and intersectional consultant on cities Chairperson Women Transforming Cities International Society, Former Vancouver City Councillor. Vancouver, BC. 18. Dr. Etsuko Joy Masuhara, Physician, Clinical Assistant Professor, Faculty of Medicine, UBC. Co-Chair, Women Transforming Cities International Society, Vancouver, BC. 19. John Price, Professor, Pacific and Asian Canadian History, University of Victoria, Victoria, BC. 20. Iemoto Yoko 家元庸子, Article9Canada, Early Childhood Educator, Vancouver, BC. 21. Sachi Rummel, a Hiroshima A-bomb survivor, peace storyteller, North Vancouver, BC. 22. Tsuneko Ishii　石井常子, Article9Canada , Coquitlam, BC. 23. Masa Kagami, 賀上真久, Article 9 Canada, Former Chair of Human Rights Committee at National Association of Japanese Canadians. 24. Kyoko Hara 原京子 Article 9 Canada, Writer, Surrey, BC. 25. Dr. Margaret J. McGregor MD, Clinical Associate Professor | Department of Family Practice | The University of British Columbia Vancouver, BC. 26. Chihiro Otsuka 大塚ちひろ, Translator, Vancouver, BC. 27. Kay Hwang, Businessman, Article 9 Canada, Vancouver, BC. 28. Takashi Fujitani, University of Toronto, Toronto ON. 29. Lisa Yoneyama, University of Toronto, Toronto, ON. 30. Michiko Inoue, Retired office clerk, Article 9 Canada, Vancouver, BC. 31. Seiko Atsuki (Roberts) 厚木ロバーツ世以子, Faculty, Kwantlen Polytechnic University, Surrey, BC. 32. Joy Kogawa, Author, Toronto, ON. 33. Kimiko Hinenoya, Montreal, QC. 34. Yusuke Tanaka, Toronto Article 9, ON. 35. Tomoko Ikeda　池田朋子, Article 9 Canada, Japanese Language Instructor, Montreal, QC. 36. Millie Creighton, Associate Professor, Department of Anthropology, University of British Columbia. 2018 Visiting Scholar, Reischauer Institute of Japanese Studies, Harvard University. 37. Dahlia Chan Tang,　Montreal, QC. See HERE for the final document including the final list of signatories.